Who would have thought a tiny triangular spinning device would take the world by storm? Yes, the Fidget Spinner has become one of the most widely used and popular toys among both children and adults. This three-sided device spins on your fingers allowing you to release stress and get rid of your boredom, sometimes keeping you stuck to it for hours. With this device, you can also perform tricks and play spinning games with your friends. However, not everyone has a Fidget Spinner, and for them, we have the new and exciting Fidget Spinner Apps that is a virtual version of the real deal. Let us take a look at the top 10 Fidget Spinner Apps that can be downloaded on your Android and iPhone device. The Fidget Spinner app by Ketchapp is one among the top ten on the list of the most well-known of its kind. Backed up by a well-designed interface, stunning graphics and control alongside great gameplay, this app comes with different spinners that can be controlled by simply swiping the bottom of the screen. Swiping up to a maximum of 5 times is allowed and each pin that is crossed would automatically unlock a new vibrant colored spinner. Free to download on both iPhone and Android devices including mobiles and tabs, the Fidget Hand spinner app is a great stress buster. Choose from a variety of colorful spinners and watch each one spin its way to beating your last high score. 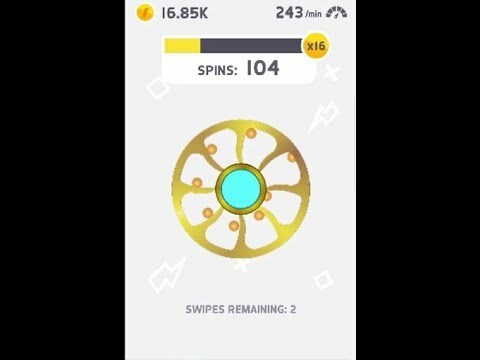 The app shows you your total spins, the current number of spins from your last spinner as well as the speed of the spinner. The Spinners vs. Monsters app is not just for fidget spinning but includes a fun and exciting game that involves the killing of monsters by spinning the fidget spinner in its direction. In this game, players must fight off each monster by defending themselves and staying alive till the end. Attacking and defending also gives you coins and bonus points that can be utilized to avail new spinner skins and to help you power up your speed. The controls are simple and require holding down on the screen to keep the spinner in play for longer. Get rid of your boredom and tension with the Spinny Fidget App. A popular virtual fidget spinning game that comes with great graphics, easy controls and gameplay as well as entertaining levels. The game is extremely addictive as new spinners can be unlocked on achieving 100 stars or more, which keeps players glued to the game for hours in order to achieve the ultimate goal. The Fidget hand spinner mega pack is uniquely designed and created for those who are crazy and cannot get enough of Fidget spinners. Offering you with a wide range of 16 different fidget spinners with a stunning 3D rotating effect on each one, this app would keep you engaged for hours. Improve your concentration and relieve yourself of stress and tension with Fidget Spinner Simulator. This is by far one among the best and most downloaded apps on the Android platform. Designed with a simplistic outlook and an option to change skins, this app allows users to increase their focusing skills and perfect for those who have trouble with concentrating. Loaded and designed with realistic graphics, sounds and effects, the Fidget Spinner Pro app is one of the most versatile fidget spinner apps available online. Similar to the real deal, in order to control the spinner, all you need to do is place your finger in the middle of the spinner to rotate the device. Play and win gems to help you unlock new spinners that include metallic spinners, silver and gold spinners as well as glow in the dark ones. Super addiсtive and free to download, the Spinner Fidget Clicker app can be played anywhere and at any time. Thanks to its brilliant graphics and gameplay, this game enables users to relieve stress and tension allowing them to focus better and improve their concentration levels. Upgrade and buy new colorful spinners with faster speed and pace by winning awards and bonuses. The Google Fidget spinner is not an app but a hidden virtual simulation game that can be played via the Google search tab. All you would need to do is type “Spinner” in Google Search, and it would give you the fidget spinner, ready to spin. This can be played both on your Android or iOS device as well as on your PC. Simply click on “Spin” to control your spinner and its speed.